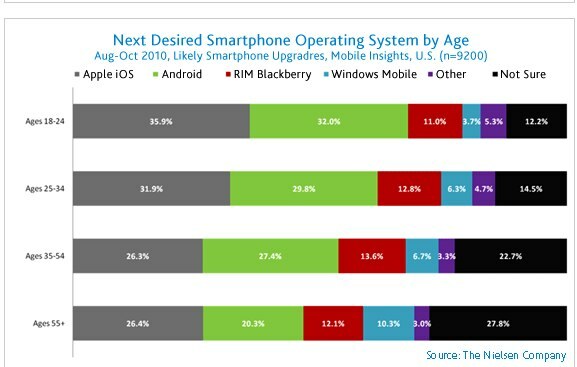 Nielsen: Apple iOS And Android Tied for "Most Desired Operating System"
Google’s Android OS continues to grow in popularity, possibly at the expense of Apple’s iOS and RIM’s BlackBerry, according to Nielsen data released today. The company reports that in an October survey, Apple’s iOS and Android were tied for “most desired” operating system” when mobile users who planned to upgrade to a smartphone in the next year were asked about their next phone. Apple’s iPhone and Android deviceswere the “most desired” among likely smartphone upgraders, with Apple showing a slight lead among those age 55+ , 18 to 24, and 25 to 34. 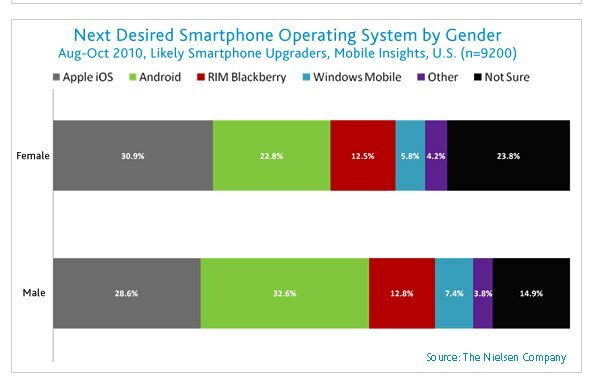 And women planning to get a smartphone are more likely to want an iPhone as their next device, with more males preferring Android devices. Among users who already had a smartphone and were planning to get a new device, these respondents leaned towards buying an Apple iPhone (35 percent), while 28 percent of both smartphone and featurephone planned smartphone upgraders indicated they wanted a device with an Android operating system as their next mobile phone. Smartphone usage continues to grow in popularity, with 29.7 percent of U.S. mobile subscribers now owning smartphones that run full operating systems. 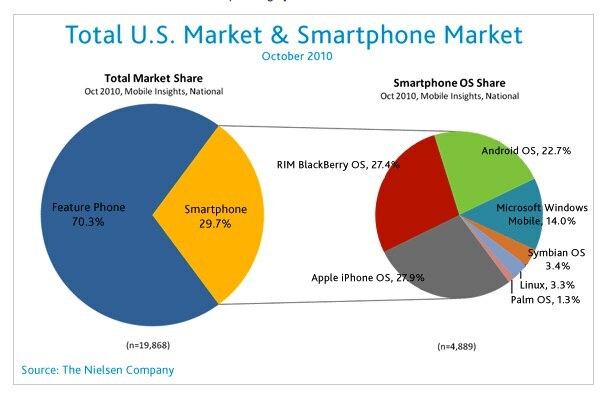 The Apple iPhone and RIM Blackberry are the most popular smartphones, each with a 27 percent of smartphone market share in the U.S. Twenty-two percent of smartphone owners have devices with the Android operating system. 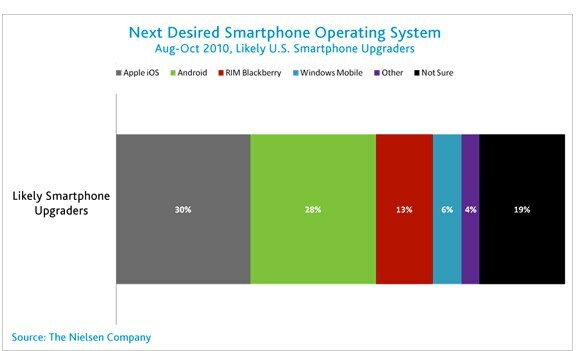 Featurephone owners planning to get a smartphone are less likely to have made up their mind about the OS they will choose: 25 percent were “not sure” what their next desired OS might be compared to 13 percent of smartphone owners. This “undecided” group could be a pretty influential market for smartphone OS companies who are looking to sway consumers. Those over 55 were markedly less certain than younger mobile users, with 27.8 saying they weren’t sure what kind of device they wanted next, compared to 12.2 percent of those 18 to 24. 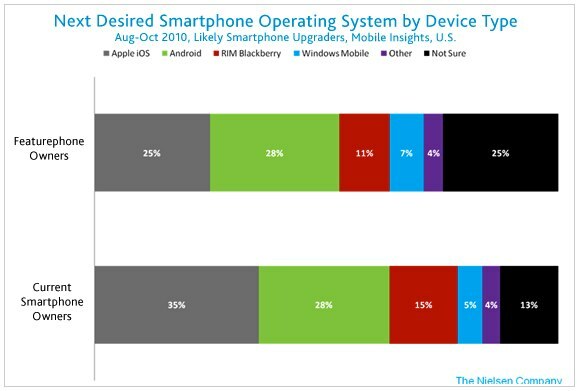 In October, Nielsen reported that Android had passed the iPhone and BlackBerry to become the popular operating system for people who bought a smartphone in the past six months.